The "Call Backs" have now been concluded. Congratulations to the winning bidders! We would like to thank both bidders and consignors for a very successful sale! 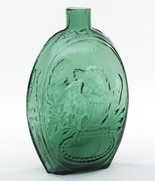 WASHINGTON - EAGLE Historical Flask, an early Pittsburgh district glasshouse, 1825 - 1835. Light yellowish-apple green, sheared mouth - blowpipe pontil scar, Pt, virtually attic mint; (only the slightest trace of faint wear, otherwise pristine perfect). GI-11. 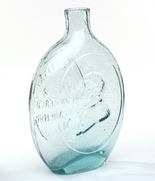 A rare mold, nicknamed the "Washington vines" flask. 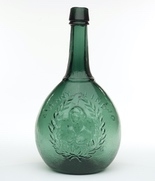 A sparkling example, the glass is filled with tiny seed bubbles, and in a delicate scarce color, the "metal" has a certain luminescence to it. Provenance: James Chebalo collection. 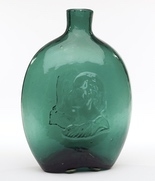 WASHINGTON - TAYLOR Portrait Flask, Dyottville Glass Works, 1848 - 1855. Gorgeous, light-to-medium pinkish-puce with profuse striations swirled throughout, sheared mouth - blowpipe pontil scar, Qt, near mint; (a little scattered light exterior wear). GI-51. Unlisted and exceptional color, incredible eye-appeal. A top example! We are privileged to offer this flask at auction, the 1st time on the market in more than 20 years. Provenance: James Chebalo collection. 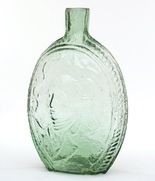 WASHINGTON - WASHINGTON Portrait Flask, Lockport Glass Works, Lockport, NY, 1850 - 1860. Rich, deep blue green, sheared mouth - blowpipe pontil scar, Qt, virtually attic mint; (just a trace bit of faint wear and a pinprick speck of roughness on the inside edge of the lip, otherwise pristine!) GI-61. A scarce mold, vivid, rare, eye-appealing color, beautifully whittled. Provenance: James Chebalo collection. 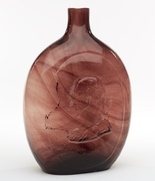 GENL TAYLOR / BUST OF TAYLOR  FELLS POINT / MONUMENT / BALTo Historical Flask, Baltimore Glass Works, 1847  1855. Aquamarine, sheared mouth  blowpipe pontil scar, Pt, very near mint; (a minor patch of faint interior milkiness near the base, otherwise perfect). GI-73. A very nice example of this scarce flask having virtually no high point wear, and with a bolder impression and stronger embossing than most! 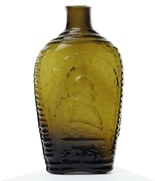 "ROUGH AND READY" / BUST OF TAYLOR - "MASTERSON" / EAGLE Historical Flask, probably a Pittsburgh district, or possibly Kentucky Glass Works, 1848 - 1855. Aquamarine, sheared mouth - blowpipe pontil scar, Qt, virtually attic mint; (a tissue-paper thin 3/16" open bubble near edge of base on reverse, otherwise perfect). GI-77. A very rare and desirable flask with the corrugated sides and crude, almost folk art bust of Taylor. Provenance: Ex. Charlie Gardner, Jim Chebalo collections. 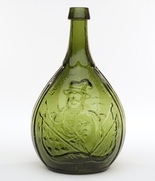 BUST OF TAYLOR - "ROBT RAMSAY / WINE & / LIQUOR MERCHT / 281 8th AVENUE / N.Y." Historical Flask, probably Dyottville Glass Works, 1852 - 1854. Aquamarine, sheared mouth - blowpipe pontil scar, Pt, virtually perfect; (small trace of very faint interior milkiness). GI-78. Extremely rare! This is the only private mold wine & liquor merchant known to have used a figured flask mold. This also is the only example, or possibly one of two, to be offered in more than 20 years! "LAFAYETTE" / BUST OF LAFAYETTE / "T.S". 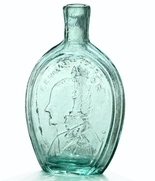  DE WITT CLINTON" / BUST OF CLINTON / "CONVENTRY / C-T" Historical Flask, Coventry Glass Works, 1824 - 1830. Medium olive amber, sheared mouth - blowpipe pontil scar, Pt, near mint; (just a slight trace of typical faint wear including a 1/8" paper-thin open surface bubble; a ¾" superficial little scuff or abrasion near the shoulder). GI-80. Nice character and with a bold, stronger than normal impression! "BENJAMIN FRANKLIN" / BUST OF FRANKLIN - "T.W. DYOTT, M.D." 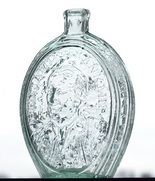 / BUST OF DYOTT - "ERIPUIT COELO FULMEN SCEPTRUMQUE TYRANNIS - KENSINGTON GLASS WORKS, PHILADELPHIA" Historical Flask, 1825 - 1835. Aquamarine, sheared mouth - blowpipe pontil scar, Qt, attic mint! GI-96. As noted by McKearin, a comparatively scarce mold. A top-shelf, bright, clean, sparkling, boldly embossed example. "JENNY LIND" / BUST OF JENNY LIND - "GLASS WORKS" / GLASS FACTORY / "S. HUFFSEY" Historical Calabash, Isabella Glass Works, Brooklyn, NJ, 1850 - 1860. Rich, medium-to-deep emerald with a slight teal tone, applied sloping collar with bevel - blowpipe pontil scar, Qt; (just a trace of minor content haze near the base; a bit of faint wear, and a 5/16" chip from the lower bevel on the back of the lip, otherwise excellent!) GI-99. Gorgeous, rich, scarce color, much deeper than most. "LOUIS KOSSUTH" / BUST OF KOSSUTH - STEAM FRIGATE / "U.S. STEAM FRIGATE / MISSISSIPPI / S. HUFFSEY" Historical Calabash, probably Millford Glass Works, Millford, NJ, 1852 - 1860. Medium-to-deep grass green, almost a lime-green coloration, applied sloping collar - "PH. DOFLEIN / MOULD MAKER / NTH 5! ST 84" (on base), blowpipe pontil scar, Qt, attic mint. GI-112. Excellent condition, beautiful and rare color for a Kossuth Calabash. "LOUIS KOSSUTH" / BUST OF KOSSUTH - STEAM FRIGATE / "U.S. STEAM FRIGATE / MISSISSIPPI / S. HUFFSEY" Historical Calabash, probably Millford Glass Works, Millford, NJ, 1852 - 1860. Brilliant yellowish-olive coloration, applied sloping collar - "PH. DOFLEIN / MOULD MAKER / NTH 5! ST 84" (on base), blowpipe pontil scar, Qt, attic mint. GI-112. Exceptional color, bubbly, brilliant, sparkling, a standout top example! EAGLE - EAGLE WITH SERPENT Historical Flask, an early Pittsburgh glasshouse, 1830 - 1840. Colorless with a slight vaseline tone, sheared mouth - blowpipe pontil scar, Pt; (a minor, 3/16" flake from the edge of the base, a couple of small spots of faint interior haze, barely noticeable, otherwise virtually attic mint). GII-9. A great example, good impression, and with almost no high point wear. 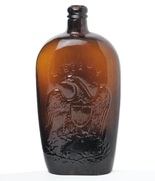 Very rare (listed in McKearin, Group A, Most Desirable Flasks). 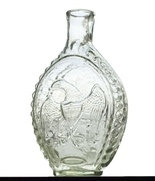 A top early beaded eagle flask. 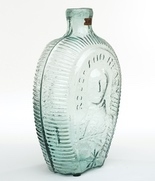 EAGLE - "DYOTTVILLE GLASS WORKS / PHILADA" Historical Flask, Dyottville Glass Works, Philadelphia, PA, 1855 - 1865. Aquamarine, sheared mouth - early smooth base, Pt, near mint; (just a trace of faint wear including a bit of minor roughness and a shallow pinhead flake on the back edge of the lip). GII-38. A bright, clean example and, as noted by McKearin, a comparatively scarce mold. These are getting harder to find and this is certainly a nice clean one. 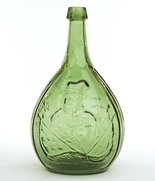 EAGLE - EAGLE Historical Flask, Kensington Glass Works, Philadelphia, 1825 - 1840. beautiful, medium emerald coloration, sheared mouth - blowpipe pontil scar, Pt, very near mint; (a minor, 5/8" shallow sliver flake near the pontil extends along the edge of the base, otherwise pristine!) GII-40. A beautiful example, good depth of color, excellent clarity, crisp mold impression, bright and clean. 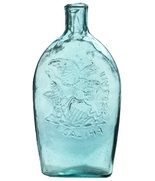 "LIBERTY" / EAGLE - "WILLINGTON / GLASS, Co / WEST WILLINGTON / CONN" Historical Flask, 1855 - 1865. Medium-to-deep golden amber with a slight reddish-orange tone, applied round collar with lower bevel - smooth base, Qt, near mint; (just a slight trace of very minor, faint wear, otherwise perfect). GII-61. A great example, nice character, plenty of tiny seed bubbles, virtually no high point wear, outstanding condition!